Abstract – When Milankovitch cycles are preserved in the geologic record, they provide a direct link between chronometer and climate change, and thus a remarkable opportunity to constrain the evolution of the surficial Earth System. Consequently, the identification of such cycles has allowed exploration of the geologic record with unprecedented temporal resolution, and has spurred the development of a rich theoretical framework for climatic change. Accompanying these successes, however, has been a persistent skepticism: how does one reliably test for astronomical forcing/pacing in paleoclimate data, especially when time is poorly constrained? From this perspective, it would seem that the merits and promise of astrochronology – a Phanerozoic time scale measured in 20,000 to 400,000 year increments – also serves as its Achilles heel, if the confirmation of such temporal rhythms defies rigorous statistical testing. The implications are substantial, since much of our understanding of paleoclimate change throughout the past 60 million years (and beyond) is firmly rooted in the supposition of accurate astrochronologies. 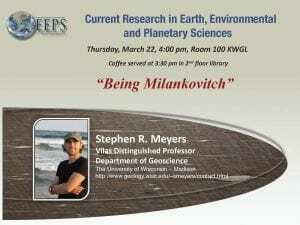 In this talk, I will present a conceptual framework for assessing Earth System response to astronomical-insolation changes and the propagation of that signal into the geologic record. This framework motivates the development of a new approach for astrochronologic testing, which evaluates time scale uncertainty while simultaneously identifying the optimal model for climate and depositional system response to astronomical forcing. The technique explicitly reconstructs distortions of the primary forcing that are known to be omnipresent in the stratigraphic record. Application of this new method to paleoclimate records throughout the Phanerozoic illuminates what it means to “be Milankovitch”, and yields new constraints on the evolution of the Solar System and the astronomical solutions themselves.